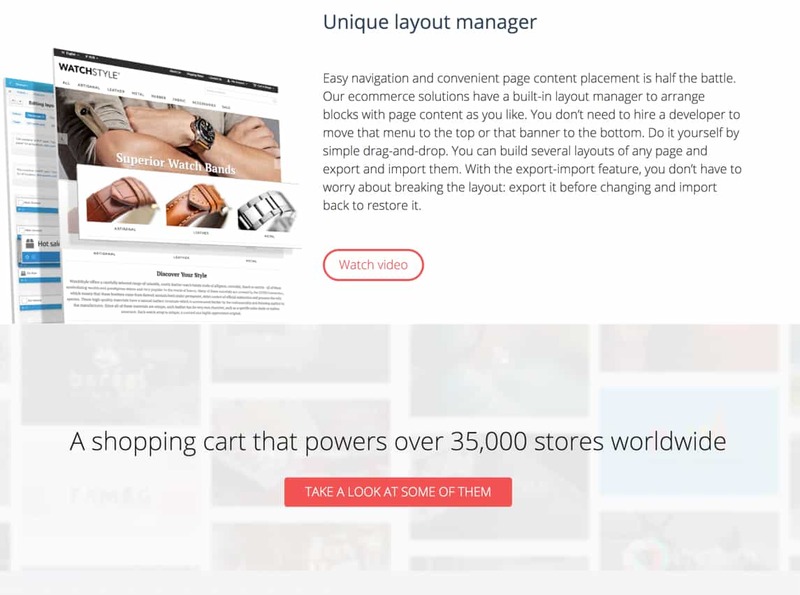 CS-Cart Review: Tons of E-Commerce Features, But Can You Scale? Looking for an e-commerce solution that offers a wide range of customization options and can scale? Read our review of CS-Cart to find out if it’s right for you. Finding a good e-commerce platform can feel overwhelming. Most go with a monthly plan, but this may not be ideal. Often, such plans impose restrictions, like a max product limit, or exclude certain features unless you buy a higher-tier plan. Many builders are too restrictive to appeal to more experienced users, or too difficult for beginners. CS-Cart Plans and Pricing: What’s Available? What are Some Good Alternatives to CS-Cart? Does CS-Cart integrate with social media and other platforms? How does CS-Cart perform in terms of speed? Does CS-Cart integrate with the WordPress CMS (Content Management System)? How Do I Install CS-Cart? CS-Cart is an e-commerce builder free of many of these issues that online entrepreneurs find frustrating. Along with a simple license purchase that gives you the lifetime ownership of the product, there are little to no restrictions. And the features locked to specific plans include only what’s necessary: a standalone store isn’t going to need an admin panel meant to manage a sprawling marketplace. Finally, it falls right in the middle as far as ease of use. It’s not so simple that it costs experienced user’s freedom, but it also doesn’t require a veteran coder’s skills. But if you can tinker with the open-source code or develop your own add-ons, more power to you! It’s just not necessary to make use of the variety of features and plugins that come with CS-Cart. Probably the most touted feature: the pricing model. With most e-commerce builders — or most online services in general — you have to pay per month for your service. And if the company raises the price, you have no choice but to shell out a higher monthly rate. Companies may also reel you in with first-time purchaser discounts, which might renew at ten times the initial price and leave you wondering why you thought using this service was a good idea. CS-Cart goes down a different route. All you have to do is buy the license for the service once. Both the higher-tier plan, which allows for multiple storefronts, and the multi-vendor plan cost a little bit more, but if you plan on using this service long-term, it’s worth the investment. When you buy the license, you get access to the open-source software and everything you need to get started (minus hosting and so on, but if you don’t have a domain yet, you can run CS-Cart locally to test it out). This model does come with a few costly snags, however. The company is not too quick to tell you that you only get one year of feature updates before it limits your service to just critical security upgrades. Not to mention the expensive support system. For now, here’s the crux of the issue: CS-Cart is a one-time pay service, at least for the core program. If you don’t care about feature updates, never look at the marketplace, and are savvy enough to not need support, you will never have to pay more than once. With that out of the way, we can look at the core of CS-Cart, the two major plans. Though the plans claim to work for smaller businesses, not all startups can pay a bulk price all in one go, making these plans more suited to mid to large sized companies. Do you envision a single decent-sized store; a big chain of multiple storefronts, or an ecommerce storeping mall or independent marketplace? Whatever your vision, there’s a way to make it work here. As far as ease of use goes, CS-Cart is no more difficult to use than any other e-commerce software available, such as Magento, Shopify, or WooCommerce. The developers strive to make things as easy as possible, and if you ever run into issues, there are well-written docs and great videos you can use to help figure things out. CS-Cart offers multiple payment and shipping options. The baseline plan comes with all the features necessary to start building an ecommerce store (or to migrate an existing one). Though it only provides support for one storefront without purchasing additional shops in the higher-tier plan, this is the perfect solution for a smaller store. It’s sold as easy to set up, and it does seem intuitive. This sort of product does require a bit of technical expertise, but the basics aren’t difficult. The admin panel especially seems simple to work with. It also comes with a mobile app and a CMS, too. If you choose to have multiple storefronts, it’s super simple to manage them while having different product sets and site designs, all from one admin panel. You can also easily customize options by adding modifiers for price, weight, and so on. You can also add attributes for color. Customers can even upload their own designs for customizable products. Selling electronic items is an option as well. With 70 payment options and 8 shipping providers, and a simple step-by-step checkout process, you won’t have any trouble getting your products to your customers. Don’t forget the block-based editor that allows quick and easy changes to your store’s design. The grid-based tool makes responsive layouts a snap, and mobile support is prominent. Choose from free or paid pre-built store designs. Then customize to suit your brand. The marketplace also sells or gives away pre-built design themes. The free ones are a bit basic and the paid ones can be pricey. One developer-made skin currently sells for close to two thousand dollars, which is out of most people’s budgets. Luckily, while still costly, the majority of themes are a bit more affordable than that. You can add some final touches, with powerful SEO tools, a decent blog function, promotions and sales, and cross-sells like “customers also bought” features. Plus there are a lot of optimization possibilities to increase site speed, and eventually, search engine ranking. CS-Cart features a demo store on their website. Browsing the demo store will give you an idea of what’s possible with the software. This is skimming the surface of feature options, but we’ve covered the most important here. If you can think of a feature, this builder probably has it — or you can code it yourself, thanks to its open-source status. 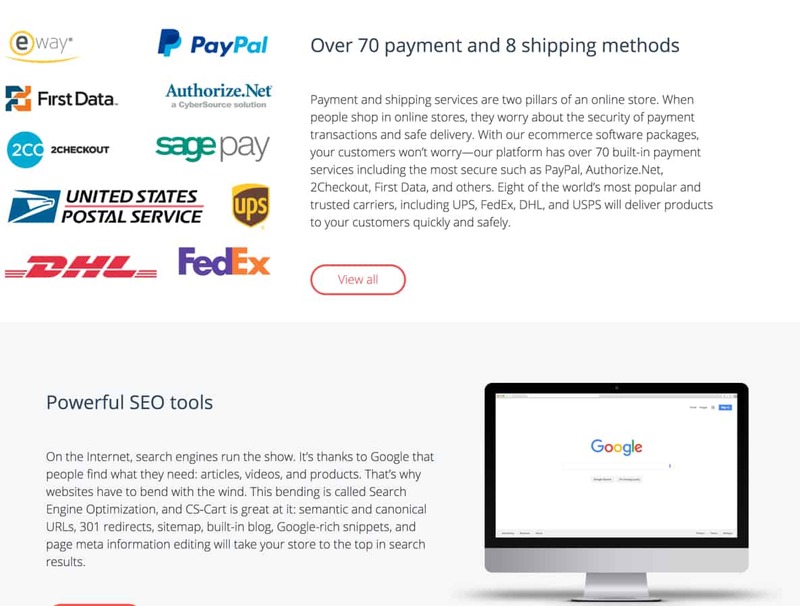 CS-Cart ships with very powerful, built-in SEO tools that will help the site you build rank well in search engine results. All you have to do is write your descriptions, tell the story of your company, provide the requested metadata, and CS-Cart does the rest on your behalf. For a larger solution, the multi-vendor plan is just what you’re after. You control a marketplace from a single storefront, where independent sellers can run their own mini-stores. Of course, creating the next eBay can’t happen alone, so plenty of administrative levels are included, which you can assign to employees. Vendors have access to their own admin panel, comments and ratings on their products, and more. And as admin, you get all the tools you need to manage these vendors like automated payouts and a product approval system. Everything the standard CS-Cart comes with is here as well. But it also comes with a robust admin panel to make managing an online marketplace a snap. You pay once to license the core CS-Cart software for life. If you opt for additional features, CS-Cart will update them for you. After one year, a fee for additional feature updates will apply. There’s a huge marketplace for add-ons, with quite a few free ones to get you started. These range from live chat modules to Facebook comments to popups. Most are pretty simple mini-plugins, but still super useful for a number of applications. As for paid add-ons, those can range from simple to complex. You can buy a little parallax package for under $10, but an auction plugin will run for over $50. Some plugins can also get up to a couple hundred dollars. Depending on what your store needs, be prepared to spend some money on add-ons. How fast your online store loads has a direct impact on conversions. Out of the box, CS-Cart boasts an impressive 95/100 points in Google’s Page Speed Test. If you are interested in CS-Cart, chances are that you have looked into Magento and (if you are a WordPress user) WooCommerce as well. How do these options compare to CS-Cart? Which option is best for you? There are several e-commerce platforms offered under the Magento banner. If you are looking for a free, open source e-commerce platform, look no further than Magento Community Edition. Magento Community Edition is a feature-rich option that has been in development for quite some time and is a mature option that will likely meet most, if not all, of your needs. If the idea of doing everything yourself is overwhelming, there is Magento Commerce, which is a full e-commerce (platform-as-a-service — PaaS) solution similar to CS-Cart. For those who are not interested in tackling any of the web hosting or infrastructure-related aspects of getting an e-commerce site set up, there is Magento Commerce Cloud, which is the software-as-a-service (SaaS) option. The paid versions of Magento are more expensive than CS-Cart and are aimed at businesses handling a larger volume of transactions, but they are slightly easier products to use. Magento also has a larger community so that you will find more in terms of tutorials/how-to guides, tips, tricks, and ideas, and so on on the internet. If you do not have (or plan to have) a WordPress site, WooCommerce is not an option for you, since WooCommerce is a WordPress-specific plugin that adds full e-commerce functionality. For WordPress users, we would highly recommend trying out WooCommerce. It is an excellent product that integrates well, and as a small business owner, likely contains more than enough features and functionality to meet your needs. Only when you scale up are you likely to run into any software-related limitations. The biggest problem you might run into with WooCommerce is pricing. We were unable to find explicit details, but we did notice there are all kinds of bells and whistles that you can purchase for your shop (such as themes), and all of this will add up. If you can get over the issues with the support and paid updates, CS-Cart makes a great, feature-packed solution for many businesses. Just the base program comes with a ton of extremely useful add-ons, and with the free packages from the marketplace, you’ll be well on your way. While it’s a bit costly, it’s easy to recommend CS-Cart, especially if you’re an experienced coder or have one on your team. A one-time license is lucrative, and smart programmers can completely circumvent the need for feature updates, expensive add-ons, or support help. With the endless useful features, optimizations, and more, CS-Cart is a great choice for companies who want to get the best value for their money. There are no restrictions on what you can do, and it just takes a little inspiration to make a beautiful, functional store. Here are some common Q&A about CS-Cart. 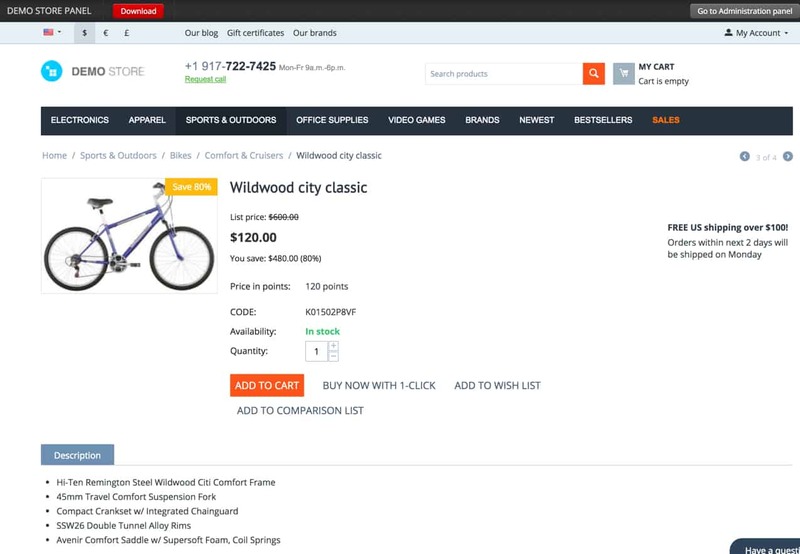 CS-Cart allows you to export your products to eBay, Google Shopping, and Facebook. The Google export add-on is included with CS-Cart as standard. Meanwhile, the Facebook Store and Ebay synchronization add-ons can also be purchased through the platform’s add-on store. The CS-Cart platform comes complete with support for Amazon’s CloudFront CDN (Content Delivery Network). This stores your store’s static data such as images and CSS files are stored on servers which allow them to take a shorter path to users’ browsers. The platform also includes client-side optimization and scored 95 points out of 100 in the Google Page Speed test. CS-Cart does not work with WordPress. Instead, it uses its own fully-fledged Content Management System. The built-in CMS makes it easy for you to create SEO-friendly content pages with minimal effort. You will also have full control over the navigation functionality of your store. Using CS-Cart requires you to do a fair bit of legwork to get everything you need up and running. Before you begin, however, you will want to make sure that you have everything you need to install and run CS-Cart successfully. There are also server configuration changes you will need to make. CS-Cart provides some excellent documentation with very explicit instructions, so we think that anyone who wants to could successfully tackle this project. However, as you can probably tell, CS-Cart installation may not be the greatest project for a beginner, especially one who is also working on getting their business-related website, domain name, and email set up. Regardless of how comfortable you are with servers, web hosting, and the like, CS-Cart set up will take time and effort, and as a small business owner, this may not be a feasible investment for you (or at least, not at this time). You are here: Home > E-Commerce Solutions: Which Is Best For Your E-Commerce Business In 2019? 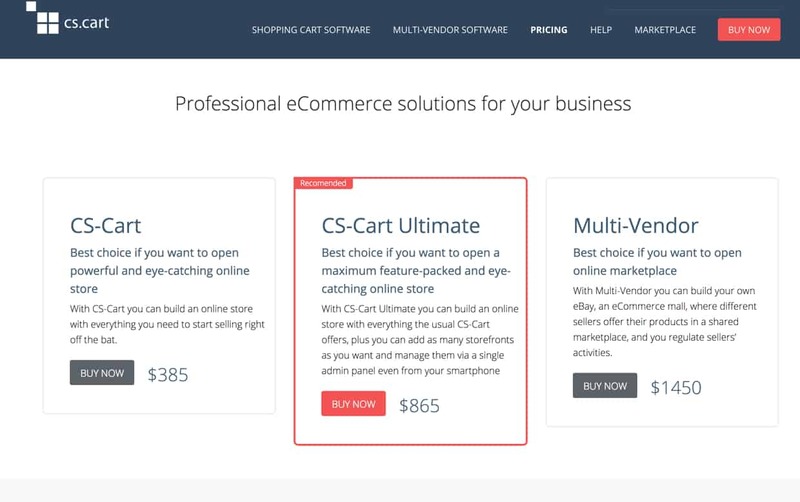 > CS-Cart Review: Tons of E-Commerce Features, But Can You Scale? Next: Bigcommerce Review: How Big Is Bigcommerce, Anyway?